I have been interested in architecture for a long time. Some of my drawings are from books, some of them are from the photos I took, and some of them are from my mind. Drawings are my daily work. Since I did Chinese calligraphy for several years, I like working on the lines as well as on the drawings. 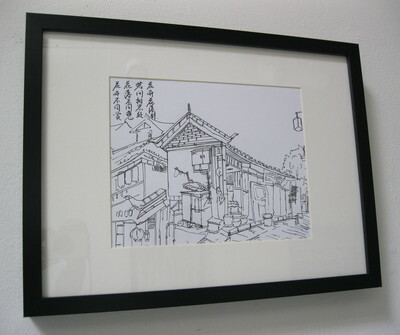 The poems which attach with my drawings are the Chinese traditional poems. I write them as calligraphy that match the drawings. Each of the poems represents my emotion at that moment—how I felt when I drew that architectural drawing. This work appeared in All Ways, All Ready, the 2014 Portfolio Exhibition at Linfield College. Photograph courtesy of Suzanna Sumkhuu. Yan, Yu, "Architectural Drawing 02" (2014). 2014 Student Portfolio Exhibition. Image. Submission 21.